The Wyoming House passed its ag-gag bill, HB 126 this last week. The summary of the bill states “An ACT relating to agriculture; establishing the offense of interfering with an agricultural operation; providing immunity for reporting cruelty to livestock as specified; providing for assistance by livestock board; providing definitions; providing a penalty; and providing for an effective date. The bill, sponsored by Rep. Wallis (R) and Senator Driskill (R), passed with a 33 to 27 vote. The bill makes it a crime to “knowingly or intentionally” record images or sounds of an agricultural operation with concealed devices without the owner’s consent. The bill does state that anyone who reports abuse to local police “within 48 hours” is immune from civil liability. Criminal penalties, however, include six months in jail and a $750 fine. The bill now goes to the Senate for discusison and vote. 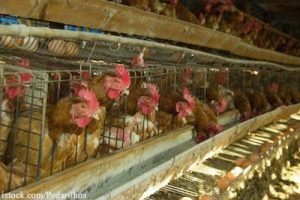 Ag gag bills are criticized by animal rights groups such as the Humane Society and consumer groups such as Slow Food USA as protection for factory farming where animal abuse has been demonstrated. In fact, the Humane Society says that these bills “aim to keep us in the dark about factory farming” by silencing whistleblowers. Using undercover recording, HSUS has documented abuses at a Vermont slaughter plant, a cow slaughter plant in California, and Wyoming Premium Farms. Employees at those facilities have been charged with animal abuse. Meat produced at the California plant was recalled, and the Vermont facility was closed. Seven states currently have ag-gag laws introduced in their legislatures, including Arkansas (SB-13 and SB-14), Indiana (SB-0373 and SB-0391), New Hampshire (HB 110), the Wyoming bill, Pennsylvania (HB 683), Tennessee (SB 1248 and HB 1191), and Nebraska (LB-204). And Illinois just introduced SB1532, sponsored by Sen. Chapin Rose (R-Champaign). This bill would impose criminal charges against anyone who complains about inhumane treatment of animals that the state Department of Agriculture finds is “false or unfounded”.